Complete fleet includes multi-function units, high-speed brooms, and snow blowers. OSHKOSH, WIS. (Jan. 24, 2017) – Oshkosh Airport Products, LLC, an Oshkosh Corporation (NYSE: OSK) company, has delivered 33 Oshkosh snow removal vehicles to the Dallas/Fort Worth International Airport (DFW) in Dallas, Texas. The purchase includes: 14 Oshkosh® HT-Series™ multi-function units, eight Oshkosh H-Series™ XF front-mounted, high-speed snow removal brooms, five Oshkosh H-Series high-speed snow blowers and six Oshkosh P-Series™ trucks. 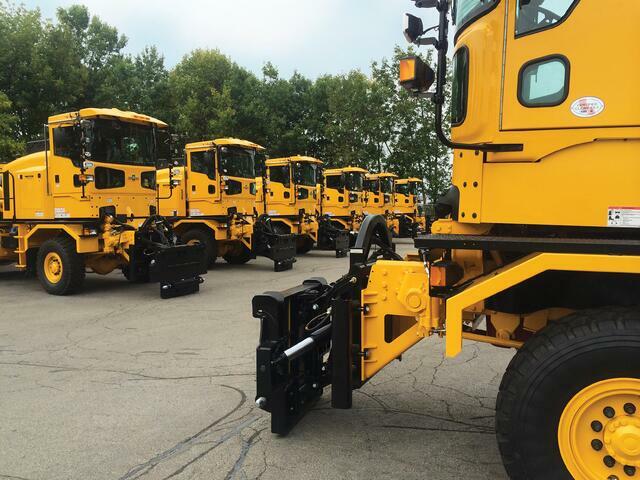 The purchase represents one of the largest airport snow removal apparatus orders in the company’s history. The Dallas area is not known for frigid winter temperatures. However, periodic storms that combine snow, sleet and/or freezing rain can disrupt air traffic with a potential ripple effect across the country. When the new equipment is in service, the airport will be able to simultaneously clear runways on both the east side and west side of the airport. The 14 Oshkosh HT-Series multi-function units each feature 24-foot front-mounted plows and 22-foot towed brooms. A multi-function, all-purpose vehicle in the truest sense of the word, the apparatus can simultaneously perform a myriad of functions, including plowing and brooming. The HT-Series snow tractor offers superior maneuverability with larger plows and brooms and, when teamed with the available ALL STEER® electronic all-wheel steering system, it can complete a runway U-turn within just 75 feet. The eight Oshkosh XF front-mounted, high-speed brooms include a 46-inch diameter sweeper broom and dual forced air blowers (producing 450 mph velocity air simultaneously from both sides of the vehicle). The broom head and air blower are hydrostatically driven, with infinitely variable speed hydraulic pumps and fixed displacement motors. The units also include an innovative active weight transfer system that keeps weight on the front axle for improved chassis and broom performance. The units are configured to meet the specific requirements of DFW. The Oshkosh towed and front-mounted brooms include the SIB cassette brush system to greatly reduce bristle-changing time and labor costs. The SIB cassette brush system features easier operation, minimal vibration, and less snow packed in the bristles compared to traditional wafer brush systems. In addition, the system’s design and quality of materials improves bristle retention and reduces foreign object debris (FOD). The five Oshkosh H-Series high-speed blowers can each throw up to 5,000 tons of snow per hour, with a cast distance of up to 200 feet. The system features a two-stage blower head, a variable speed hydrostatic ribbon, and a dedicated 700 HP engine. The six Oshkosh P-Series 6 X 6 (model 2552) trucks feature a 77,000 lb. axle capacity and will be equipped with a 5,000-gallon deicer tank and hydraulically actuated booms that swing out when deployed. Unlike many commercial vehicles that are adapted to airport snow operations, the Oshkosh P-Series is engineered and built to perform flawlessly in the most severe winter conditions. Photo caption: Oshkosh Airport Products has delivered 33 snow removal vehicles to the Dallas/Fort Worth International Airport (DFW) in Dallas, Tex. The purchase represents one of the largest airport snow removal vehicle orders in the company’s history. Pictured here are the last six units at the factory being prepared for delivery to DFW. Dallas Fort Worth (DFW) International Airport is the world's fourth busiest airport, offering nearly 1850 flights per day and serving 64 million passengers a year. Located halfway between the cities of Dallas and Fort Worth, Texas, DFW provides nonstop flights to 149 domestic and 58 international destinations, with service from 27 passenger airlines (including ten international carriers) and 21 cargo carriers. DFW is one of the highest capacity commercial airports in the world, with seven runways and 165 gates. DFW also serves as the home and largest hub for American Airlines, the world’s largest carrier, and airlines at DFW serve customers with nonstop flights to five continents. Oshkosh Corporation is a leading designer, manufacturer and marketer of a broad range of access equipment, commercial, fire & emergency, military and specialty vehicles and vehicle bodies. Oshkosh Corporation manufactures, distributes and services products under the brands of Oshkosh®, JLG®, Pierce®, McNeilus®, Jerr-Dan®, Frontline™, CON-E-CO®, London® and IMT®. Oshkosh products are valued worldwide by rental companies, concrete placement and refuse collection businesses, fire & emergency departments, municipal and airport services and defense forces, where high quality, superior performance, rugged reliability and long-term value are paramount. For more information, log on to www.oshkoshcorporation.com.